Have you ever had a day when all your shots extracted like the photos to the right and tasted worse than they looked? Uniform extractions provide a strong foundation for excellence in the cup. 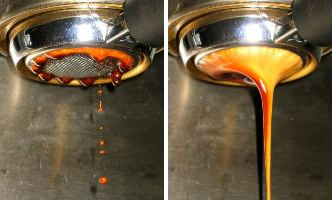 The bottomless or "naked" portafilter is an invaluable tool for evaluating your extractions, because it mercilessly exposes any flaws in your technique and the resulting pour. With the bottomless portafilter, you can observe an ideal extraction that begins with a uniform pattern of beads on the bottom of the filter basket. Droplets momentarily arise from multiple extraction points, then rapidly coalesce into a single stream. A beautiful pattern of tiger striping will be clearly evident. As the pour progresses, the stream gradually lightens in color, again in a uniform fashion. The perfect pour will show no evidence of early blonding, channeling, spritzes, or other woes that often befall the novice bottomless portafilter user. 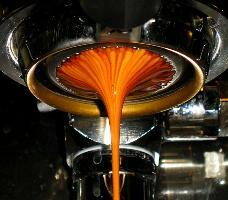 Uneven espresso extractions are a clear indication that some portions of the coffee are underextracted and others are overextracted. Does the pour begin around the rim of the filter basket? Is it unbalanced, favoring one side of the basket? Do you suspect channeling, as evidenced by greater flow and early blonding in parts of the basket? Any of these extraction flaws leads to unbalanced and undesirable flavors in the cup. "Distribution is the most misunderstood, neglected and really critical variable within your control. For good espresso, a requirement and the goal is to create an even density of coffee within the basket. For most baristas (professional or passionate enthusiast) this is where technique fails most noticeably... Keep in mind all the time what the goal is—to create an even bed (an even density of coffee within the basket). If you get this right, then your odds of correct extraction are going to go way way up. To be honest, everything else is less important when it comes to a constant evaluation. Tamp (for example) is not nearly as important as everyone seems to think. The goal with your tamping is to preserve the distribution and to create a firm enough surface." Epiphany! Grind, dose and distribution are critical to fine espresso. But unfortunately for home baristas, most high-end espresso grinders are designed for the fast-paced production of a commercial environment. Smaller capacity grinders found in even the best equipped home espresso environment may suffer from clumping, static, and uneven distribution. The home barista must overcome these hurdles to achieve an extraordinary espresso pour. Although the rhythmic thwack-thwack-thwack of the doser vanes help reduce clumping, they inevitably pitch the grounds off to one side, leading to an uneven distribution of grinds in the filter basket. Worse yet, removing the doser may create a "clump monster", as demonstrated by the photo on the far right. We can hope that these design flaws will eventually be addressed in home grinders. 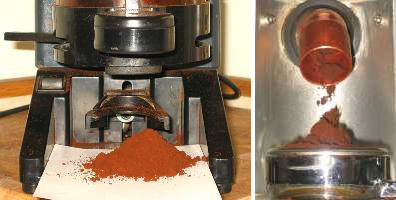 But until then, there is a simple, inexpensive solution to grinder problems: the Weiss Distribution Technique, or WDT. The WDT involves stirring the grounds with a thin object (such as a dissecting needle) to break up clumps and even the distribution. Stirring creates a uniform distribution of grounds throughout the filter basket, which is impossible to achieve by pushing the grounds around the surface of the puck. You need to get all the way down to the bottom of the basket, and the needle permits this. To reduce mess, one other piece of equipment is required: a yogurt container with the bottom cut off. This serves as a funnel that sits in the filter basket and keeps grounds from flying out as you stir. Dose into this contraption and you can stir as vigorously as you wish. The WDT requires no major changes to your espresso brewing regimen. After stirring to declump and distribute the grounds, remove the funnel, and use your favorite method to dose, level, tamp, and pull the shot. Empty yogurt container, with bottom cut out to make a funnel that wedges securely into the top of your filter basket. A pointy implement; I use an inexpensive dissecting needle (yes, it has only been used for this purpose!). Wedge the yogurt funnel into filter basket. Grind and dose directly into yogurt funnel/filter basket, until you have a mound of coffee grounds that heaps slightly over the rim of the filter basket. Stir grounds vigorously with needle. Remove yogurt funnel and level grounds to the top of the filter basket. Let's look at these steps in more detail.